Not a lot of people know about PowerPoint add-ins, but those who do swear by them! Here is a list of our 8 favorite PowerPoint add-ins, what they are, why they rock, and how to get them. Download and use them, and we guarantee you'll see a huge increase in your productivity in PowerPoint – not to mention the amount of cool new things you’ll be able to pull off! Enjoy! This awesome (and recently updated) feature of the “PPTools StarterSet”, a free add-in created by Microsoft MVP, Steve Rindsberg, allows you to copy/paste an object’s position on a slide onto any other object. It’s our favorite add-in in the world because it’s so simple and yet so powerful! We use it every day. Oh, and Taylor helped rename it, too! This add-in solves one of the most common mistakes that make presentations look unprofessional: objects that move from slide to slide when they should stay in the same position. We use it every single day and that’s why we call it “Must Have PowerPoint Add-In of the Century”! THOR is an updated version of the Hammer Tool that was previously part of Steve’s “PPTools StarterSet”. Click here to download it (it’s free but we encourage you to donate something as a thank you to Steve for creating such a wonderful tool for us). We also created an entire blog post + video on how to use this tool, which you can see here. This add-in is a highly sophisticated software that allows users to quickly create highly-customizable, and uniquely distinctive timelines and Gantt charts, as well as easily edit them. If you build a lot of timelines and Gantt charts, this add-in will not only save you hours of work creating those graphics, but it will also save you time when you need to go back in and update them later on (which fits into one of the core best practices we teach here at Nuts & Bolts: “Respecting Both Ends of the Deck”). We were told about this tool by one of our students (thanks Tony!) who swears by it, along with over 1 Million other users. Office Timeline has a “freemium” model, meaning that there’s a free basic version and a paid full version. Click here to download it and learn more. Okay, rhetorical question; of course you are (if you're not, we need to have a conversation). Pexels is one of our favorite websites for beautiful and 100% copyright-free images on the web, and this add-in is a huge time-saver for anyone searching for and adding images to their decks. 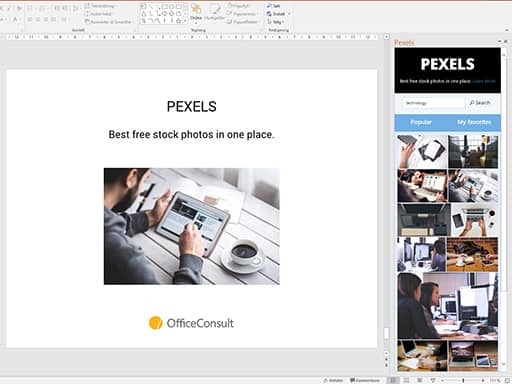 This awesome add-in allows you to seamlessly search for and insert great-looking and free stock photos from Pexels directly within PowerPoint. No need to open up a web browser, find an image, download and save it, and then paste it into your slide. Simply open the add-in, find your image and click on it. Done! This is an unofficial app by OfficeConsult, and you can download it for free on the Office Store site here. This free add-in is a Godsend for anyone who uses a lot of animations and motion paths! What used to take hours of tedious trial and error alignment, can now be done with the click of a button! Even though the results often look simple, without this add-in, you would have to match up all your animations manually…that’s why it’s such a huge time and life saver, and why P-Spice calls it “the Must-Have Tool for all Serious Animators”! You can download and learn more about this free add-in by clicking here (it’s free but we encourage you to donate something as a thank you to Shyam for creating such a wonderful tool for us). You can also see examples of how to use it and why it’s awesome on P-Spice’s blog post here. This wonderful add-in packs in a whole bunch of features that mainly help you with creating better effects and animations in your slides. As a side-note, PowerPoint Labs was created and is still run (as of June 2016) by students at the National University of Singapore. The add-in has been public for about 3 years and they have guaranteed funding for the next 2-3 years to keep it free. This plugin is great for students or professors, or anyone who’s been tempted by Prezi, with its cool transitions and zooming effects. We particularly like the special effects such as the spotlight, the magnifying tool, and the enhanced picture crop tool. PowerPoint Labs is entirely free. You can download it and learn more about it here. 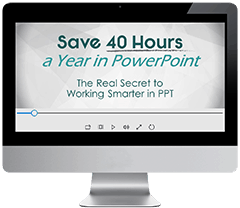 Power-user for PowerPoint is an add-in that was conceived and designed for the PowerPoint power-user, specifically to enhance their productivity up to 30% to meet deadlines, save time and reduce labor costs. While we love most of the very many features (this add-in is really packed full of features! ), the ones we feel will boost your productivity the most are the ones that deal with the biggest time-waster in PowerPoint: formatting. Power-user has a free trial as well as a paid version. You can download it and learn more about it here. Sometimes you know the shortcut or the trick to do something, but you just want the ease of being able to click a button and be done with it. This add-in is designed to do that for you. 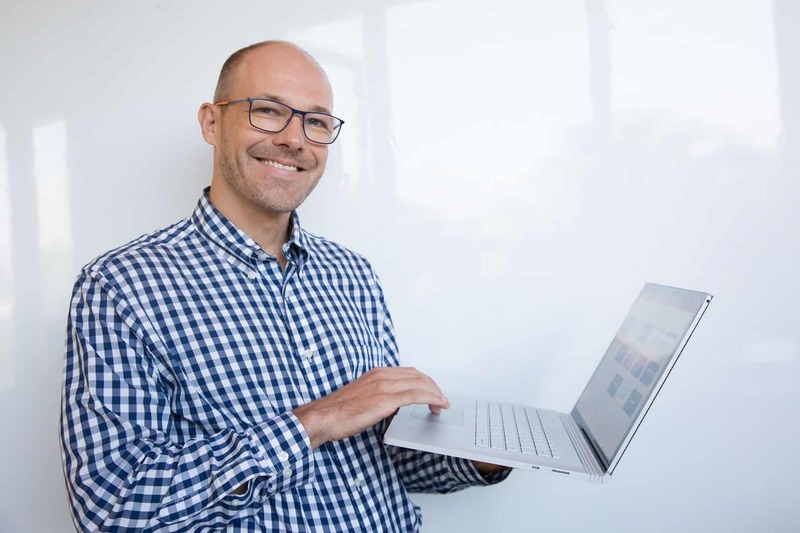 In exchange for your contact information, you can download the add-in for free on Maurizio’s site here. 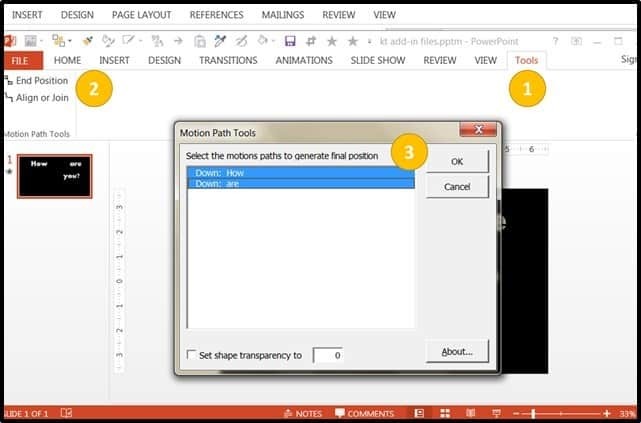 This is another awesome free add-in created by PowerPoint MVP Shyam Pillai, that allows you to easily insert YouTube videos into a PowerPoint slide. All you need to do is to provide the YouTube video URL that appears in the browser address bar, and the rest is taken care of by the YTV Wizard. If you embed a lot of videos from YouTube into your slides, this plugin will save you a bunch of time navigating the various methods to do so…especially if you have PowerPoint 2007, which normally requires getting and manipulating the video’s URL, which is tedious and prone to error. This easy method of using a add-in is awesome because it does all of the hard work for you! You can download and learn more about this free add-in by clicking here (it’s free but we encourage you to donate something as a thank you to Shyam for creating such a wonderful tool for us). You can also see how to download, install it, and use it on our blog post on embedding YouTube videos here.